Spectacular 4-bedroom, 3.5-bathroom house has two master suites, each with a private bathroom and walk-in closet located on the first and second floors. The family room features an all brick, gas log fireplace. A large kitchen, with oak cabinets, ample storage opens to a cozy dinette. A dining room, sitting room and sunroom are featured. Beautiful views from every window. The 3-room finished walk-out basement offers options including additional living space, recreation area, a large workshop and access to a private circular drive-through. 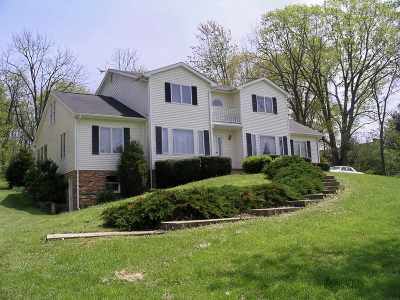 This house is nestled in a pleasant community on 5 scenic acres. Call for an appointment.